Buddhists, yogis and ayurvedic doctors have said for centuries that meditation improves health and well-being. Now scientists are trying to prove it. Several clinical studies have documented specific ways that meditating may help people stay healthier, sharpen mental focus and gain more power over their emotions. Some studies even show that the brain of someone who meditates may be physically different from the next guy’s. Scientists say it’s a very new field of study. But their findings to date offer compelling confirmation to the more than 20 million Americans who meditate — and tell skeptics that those who are getting on the cushion every day might be onto something. When emotions wreak havoc, it helps to “get it out” — ranting to a therapist, friend or spouse, or writing about your feelings in a journal. Sitting down on a cushion to meditate is seemingly the polar opposite of this catharsis. But could it be that the two approaches are helpful for similar reasons? Talking or writing about your feelings forces you to call them something. And one technique taught in mindfulness meditation is naming your emotions. It’s part of noticing and detaching from those emotions vs. letting them hijack your bliss. Meditation instructor Dianna Dunbar calls it “the mindfulness wedge.” It’s about “helping people develop that pause button,” she says, so they can observe emotions from the outside. Two UCLA studies showed “that simply labeling emotion promotes detachment,” says David Creswell, Ph.D., a meditation researcher at the university who joined colleague Matthew D. Lieberman, Ph.D., in heading up the studies. Using functional magnetic resonance imaging (fMRI) to record brain activity and pinpoint where in the brain it occurs, Lieberman’s team found that assigning names to negative emotions turns down the intensity of activity in the amygdala — an almond-sized sector of the brain that acts like an alarm system: When you witness a car crash, argue with your spouse or get yelled at by your boss, it’s your amygdala’s job to set off a cascade of stress-related reactions. Creswell’s 2007 study supported these findings. His team asked 27 undergraduates to fill out a questionnaire on how “mindful” they were — how inclined they were to pay attention to present emotions, thoughts or sensations. They found a striking difference between the brains of those who called themselves mindful and those who didn’t: Mindful patients showed more activity in the areas that calm down emotional response, known as the prefrontal cortex; and less activation in the amygdala. Twenty-year meditation practitioner Joyce Bonnie says the UCLA findings aren’t surprising to her. But she says having that emotion-diffusing ability is one thing, and using it is another. Still, the clinical results “may explain the beneficial health effects of mindfulness meditation,” Creswell says, “and suggest why mindfulness meditation programs improve mood and health. Can meditation make you healthier? Thirty-seven-year-old mom Nikki Ragonese has meditated for six years as one way to cope with painful degenerative osteoarthritis. 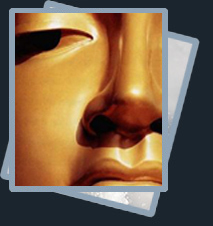 Meditation, she says, makes it easier to accept her pain and the difficult emotions it fuels. Science is starting to churn out more evidence echoing Ragonese and Dunbar’s experience, showing signs that mindfulness meditation can help ease symptoms of conditions including psoriasis and hypertension as well as chronic pain. Meditating also slows breathing rate, blood pressure and heart rate, and there’s some evidence that meditation may aid treatment of anxiety, depression, high blood pressure and a range of other ailments. The buzz about meditation’s ability to turn out shiny, happy people makes you wonder: Do people who meditate have something different going on upstairs than non-meditators do? The results were astounding: Brain regions associated with attention, sensory awareness and emotional processing — the cortex — were thicker in meditators. In fact, meditators’ brains grew thicker in direct correlation with how much they meditated. The findings suggest that meditation can change the brain’s structure — perhaps because certain brain regions are used more frequently in the process of meditation, and therefore grow. Yet for anyone accustomed to waiting for a chorus of nods from science before trying alternative methods, these tip-of-the-iceberg findings may be ample proof of what Eastern cultures have been saying for centuries: Meditation is good for you. 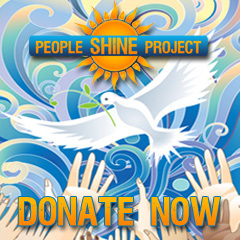 The People Shine Project allows people to not only engage in and learn more about integrative medicine best practices in a safe and supportive environment, but actually provides the means under one roof for people to become exposed to and experience a variety of modalities and methods that are often available only through high-end wellness centers, posh recovery retreats and exclusive spas. It is our purpose to make these types of leading-edge services ACCESSIBLE AND AVAILABLE TO EVERYONE. As people begin to see profound physical, mental, emotional and spiritual transformation, these practices are destined to become a permanent part of a healthy menu of good self care.